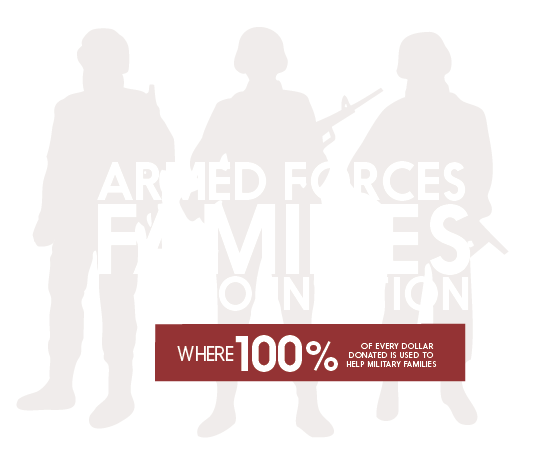 100 PERCENT OF ALL DONATIONS RECEIVED ARE USED TO FUND PROJECTS TO SUPPORT THE FAMILIES OF OUR SERVICE MEN AND WOMEN. The Armed Forces Families Foundation is a 501(c)(3) non-profit organization made up of volunteers from many communities across the United States. Our commitment has led to the completion of multiple projects that will benefit the families of our service men and women for years to come. Our focus is primarily on areas of significant need which often fall outside the tight budget constraints of the military and its family support organizations. All funds remain local so donors can see their dollars at work.